So here instead of the gifts being avatars , clothes , scenes , rooms and so on . How about a song request gift topic ? of being like gift the person above you I suggest for this topic that if you want a certain song you just request it here . 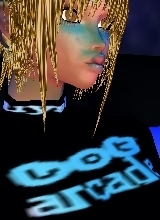 on IMVU feel free but conflicts of interest are apparently obvious . . I have loads of music I wish was on IMVU... It would probably be easier listing what I wanted, lol. Something I really want IMVU to implement is a "Show all songs" feature. I'm the type of person who will turn on a radio station I'm unaware of and just go with it. I also just let Youtube, Pandora, etc take control and just throw music at me, whether or not I know of it. I gifted a song to ya but I dunno what happened I pushed send and . . nothing happened as in the message box stayed there , so I pushed it again . Then decided I better refresh that box and the song was gone so I think it sent to ya , I wish we had a sent box on IMVU . . Maybe we do ? thingy you could just listen to some random playlists . Where at myspace I'd not only found a ton of music I'd never heard before but also ended up being friends with some of those artists due to contacting them and whatnot . One of which i'll mention here is Jordyn Taylor whom I started to always call bye the name Princess Jordyn , it took off so much everyone started doing the same and she ended up becoming titled the official Myspace Princess . Afterward she then ended up being sponsored by the Myspace music group as one of their official artists . She seems to have since moved on to a career selling real estate in NYC , anyways . . Here is her most popular song called Strong , which on myspace within days of her posting it ended up with 10's of millions of listens .